The GHFCW Information Site Is Available! 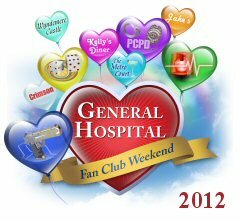 The official website for the 2012 General Hospital Fan Club Weekend is ready to provide fans with up to the minute information about the GH fan event of the year! IMPORTANT: Please GO TO THE GHFCW WEBSITE before emailing your questions about events to the fan club. Many of your questions are answered in the two FAQ (Frequently Asked Questions) pages in the red menu toward the top of the site. Reading this information CAREFULLY gets you your answers faster and frees the GHFCW staff up to work on the weekend itself! Do NOT email Debbie Morris with fan club weekend related questions. A contact link is provided on the GHFCW website for those questions. This entry was posted in GH Fan Club Weekend, GH News, Upcoming GH Events. Bookmark the permalink.